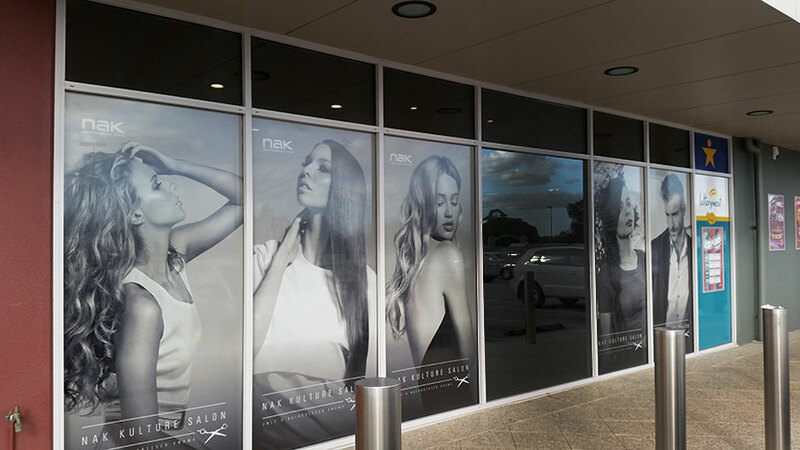 One way vision films on windows allow you to use large areas of glass for advertising, and here at Perth Graphics Centre we have the film in stock and ready to go. With expertise in not only fitting the films but also printing them as well, you’ll find that entrusting your shop windows to Perth Graphics Centre is a clever move. 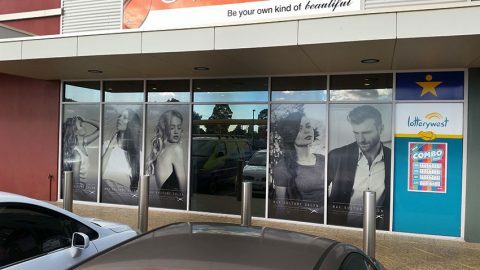 Seen here is a series of windows printed and installed for Karizma Hair in Armadale, where our choice of laminates has allowed the customers to still see through the film while cutting down some of the light and heat as well as preventing the holes in the film from filling up with water. Holes in the film? Yes, that’s how one way vision films work. It’s a perforated film with a white face for printing and on the back, a black adhesive to absorb light. This gives it it’s one-way properties. Can you use the film for the inside? No, however the film and laminate give a great barrier to the glass to help against breakage. If you have windows at your shop and want to put some signage on them, then why not consider one way vision? We’re here to answer any questions you may have. Hi, I was wondering how much for this type of product please?